Another contender has just muscled its way onto my personal favorite-steak-in-Indiana list… St. Elmo’s in Indy remains the sentimental choice, and Joseph Decuis in Roanoke certainly satisfies with hospitality and top-shelf Wagyu beef, but Chop’s Steak and Seafood in Fort Wayne has just blazed onto my scene with a sizzling debut. This locally owned strip mall steakhouse on the western side of town has actually been around since 2003, but only recently came to my attention thanks to a fellow freelancer friend in Fort Wayne. 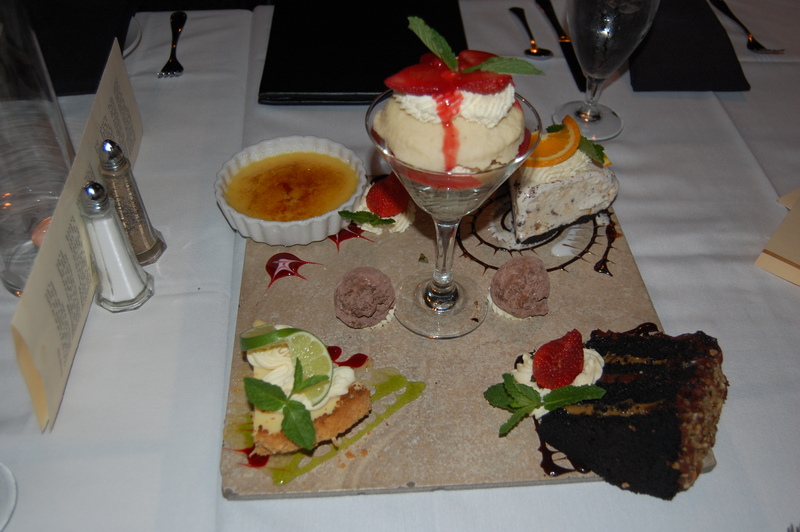 I had opportunity to visit for dinner last week, and was seriously impressed with what I saw and what I ate. Be forewarned if you’re expecting a quiet evening of intimate conversation — the restaurant is on the loud side. And the signature chopped salad could have used a little more dressing (I like my salads fairly saucy), but the tender 7 oz. 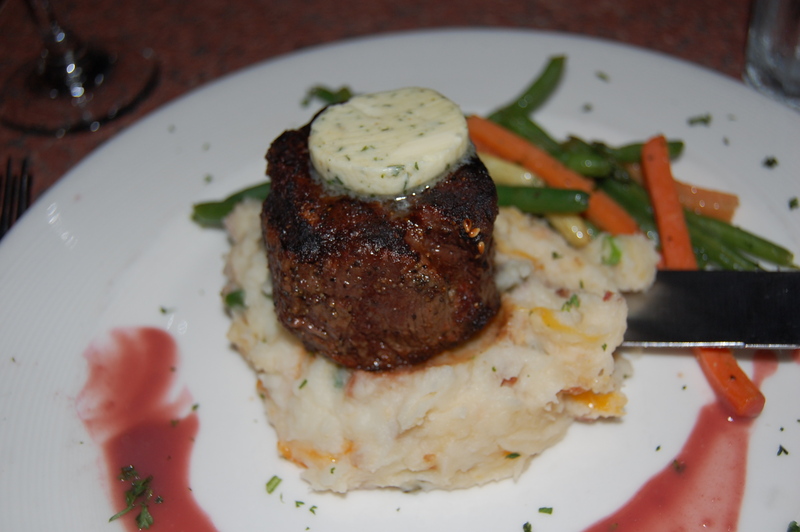 filet mignon I received was outstanding. It arrived atop bacon cheddar mashed potatoes with some veggies on the side, cooked to a perfectly pink-but-not-bloody medium degree of doneness just as requested. Lesson learned. I will never order steak in a restaurant anything other than medium ever again. This meat was perfection. Did I mention the big pat of horseradish butter on top, melting slowly into the beef? Aw. Yeah. My friend also was very pleased with her ginormous black and blue ribeye, giving it her best shot before crying uncle halfway through. She said the leftovers made a fabulous lunch the next day. To sample the seafood, my dining companion and I shared five plump grilled shrimp, which we dunked into a cocktail glass full of cocktail sauce nearly spicy enough to rival St. E’s. One bite of this stuff made my nose tingle and my eyes water, in a good way. I was hooked. Also worth noting — Chop’s features not one, but TEN house wines by the glass for $5.50, and what a glass it is. If it had been any more full, I would have had to slurp some off the top before being able to safely raise my glass without sloshing. The Malbec I enjoyed was light and lovely. If you’re a wine drinker, I daresay this has got to be one of the best deals in town. 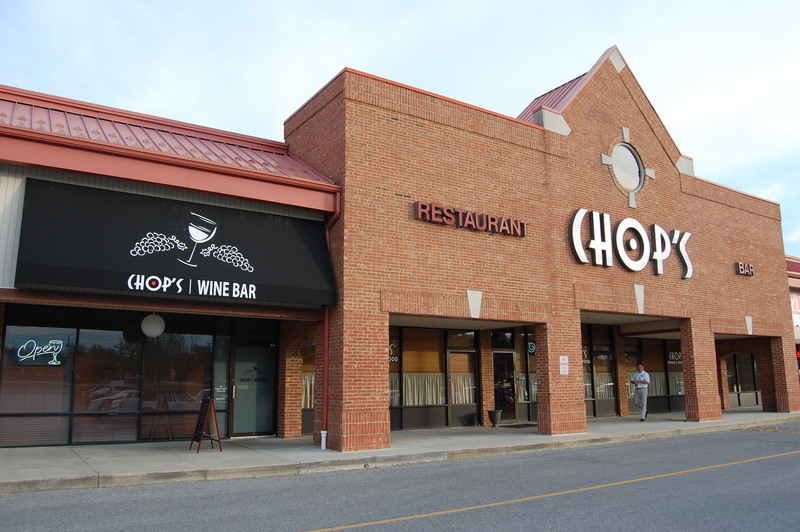 To that end, Chop’s also operates an adjoining wine bar next door that serves its own highly tempting menu of trendy plates both small and large. The CWB burger on pretzel bread, pork belly sliders, Latin-spiced lamb riblets, and an Asian-inspired chicken and waffles with Korean chili-garlic glaze and a cashew slaw make me want to look at my calendar to see how quickly I can get back up to Fort Wayne again. Our bill for two very full glasses of wine (which honestly was more like four glasses) and two entrees was right at $70, which seemed plenty fair for food and drink of this quality. If you covet red meat done right, definitely check into Chop’s on your next trip to the Fort. For more info, visit www.chopswineanddine.com. I was lucky enough to receive an invitation to attend a media tour of Fort Wayne, which took place last Friday. Hubby and the toddler tagged along, happy to swim at the hotel pool and do their own thing while I was off doing mine. It was just a quick overnight trip, but man, did we cram in a lot of good eating. The sheer number and diversity of restaurants in Fort Wayne is somewhat astounding. It is the second largest city in Indiana with a population of around 300,000, so I guess I shouldn’t be as surprised as I was to discover this. I’ll write more about the other attractions we saw in later entries; for now, I’ll focus on what was perhaps my favorite part of the day. As part of the tour, my small group got to enjoy a progressive dinner at three of the best eateries in the downtown area. On top of a great lunch and sampling at DeBrand Chocolates, mind you. I’m not sure how everyone managed to keep going, but somehow, we persevered. Our first stop for appetizers? The Oyster Bar. Those who know Fort Wayne are familiar, I’m sure. This old-school eatery has been around and operating in the form of a tavern since 1888. Today, it’s an upscale seafood joint. As a point of reference for Indianapolis folks – imagine a much smaller St. Elmo’s, but with seafood instead of steaks and kitschier decor. They do serve steaks and pasta and such at Oyster Bar, but ordering them here seems silly with fish of this caliber. To sample all we could, we shared half a dozen or so apps around the table. 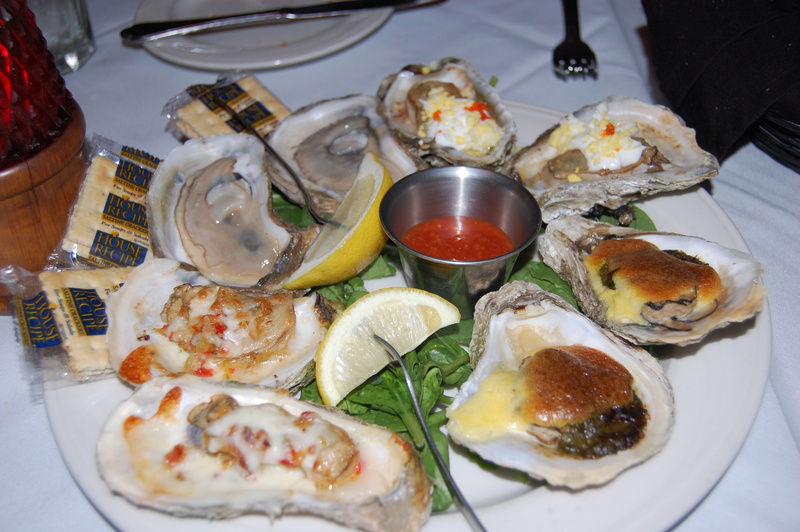 Crab cakes, mussels, oysters, Louisiana shrimp, calamari strips… Oh. My. Grouper. My eyes nearly glazed over when the dishes just kept coming. All fabulous, mind you. The shrimp was spicy but not overpoweringly so, and the mussels fragrant and flavorful. 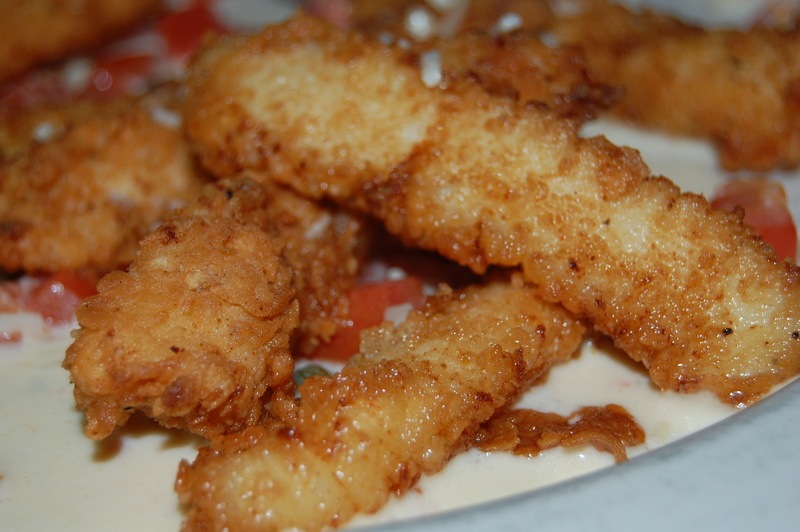 Now, I should point out that I don’t really care for calamari under normal circumstances, but I like it here, where it’s more like a tenderized fish stick than those nasty tentacly bits. I could have easily filled up at Oyster Bar, downed a glass of wine and called it a night, but there were still two restaurants to go. I paced myself with a few bites and held back. Next up for entrees — Don Hall’s Old Gas House. Don Hall is a big name on the Fort Wayne restaurant scene with a handful of restaurants scattered around town, each with its own distinctive spin. One is a diner, one is upscale fine dining, one is a Japanese steakhouse (yes, seriously), and so on. There’s even a Hall’s Grill in Castleton for Indy peeps who need a fix. The Gas House is located along the river in, you guessed it, an old gas plant facility, and has been serving there for half a century. My first meal at the Gas House was about 15 years ago when I was in town for a Barry Manilow concert at the Embassy Theater. (Those of you who know me personally are shaking your heads right now. For those of you who don’t — Hello. My name is Amy. I’m a Fanilow.) The ticket was a birthday gift from my parents and we met some of their friends at the Gas House for dinner prior to the show. Can’t remember much about that meal, except that I ordered prime rib and it was delicious. Barry was awesome, of course. The Gas House has been renovated in recent years and the décor looks beautiful, very romantic and upscale. A perfect date night destination. During the summer, they also open a deck for al fresco riverside dining, which I imagine is pretty spectacular. Our meal on Friday night was pre-ordered, so I didn’t get a look at the menu, although I would have liked to. 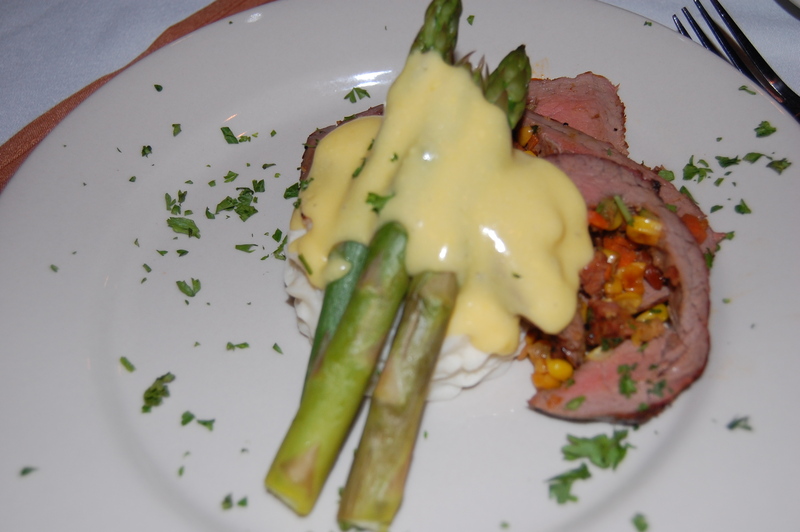 Soon after we sat down, our plates arrived — sliced beef tenderloin with mashed potatoes, corn/bacon hash, asparagus and Hollandaise sauce. Yummy. The meat was a little more rare than I would have ordered, but it was super tender and tasted great. I cleaned my plate. For dessert, we drove across the parking lot (it was raining, cut me some slack) to Club Soda. Love the name of this place. It’s also located in an old renovated building, but inside, it’s totally trendy with swanky martinis and contemporary cuisine. Our desserts were already plated and waiting for us when we arrived — three big platters, each bearing a selection of gorgeous sweet treats. Strawberry shortcake layered into a martini glass, key lime pie, chocolate bourbon cake, crème brulee, a house specialty Snickers ice cream pie, and a couple of chocolate truffles. I nearly went into sugar shock just looking at it. 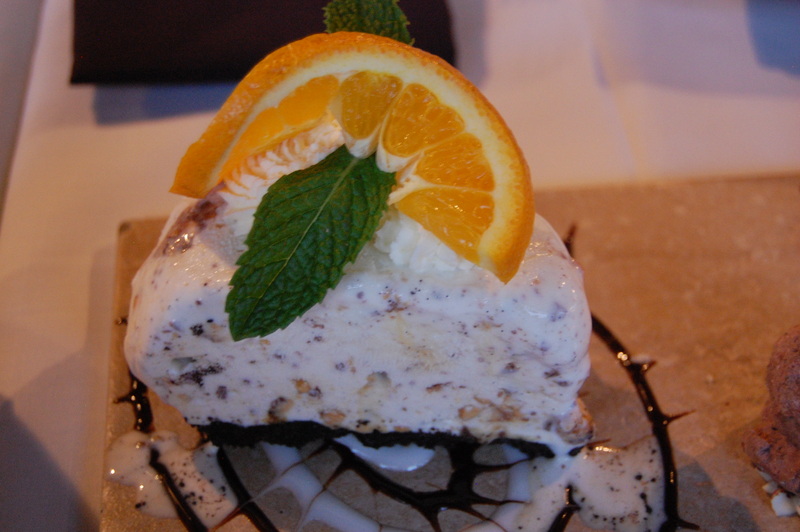 By that point in the evening, my stomach was reaching capacity, so I just nibbled a taste of the Snickers pie and the chocolate cake before tossing in my napkin and calling it quits. With that, I returned to the hotel to regroup with my guys and beached myself on the bed for the rest of the evening. With a smile on my face. My good friend Michelle is expecting not one but TWO babies (both girls) in January. Clearly, this occasion could not go uncelebrated! Since Michelle already has a five-year-old daughter, she’s pretty set with girly pink schwack and supplies, but I figured she could never have enough diapers. Therefore, I swiped an idea from another baby shower I attended last summer and decided to throw her a “Pamper Michelle” party, asking everyone to bring a pack of diapers in lieu of gifts. I wanted the food to be reflective of babies and twins, so opted for mini versions of standard party fare. Several recipes were previously untested dishes I’d been wanting to try, and this seemed a perfect excuse. 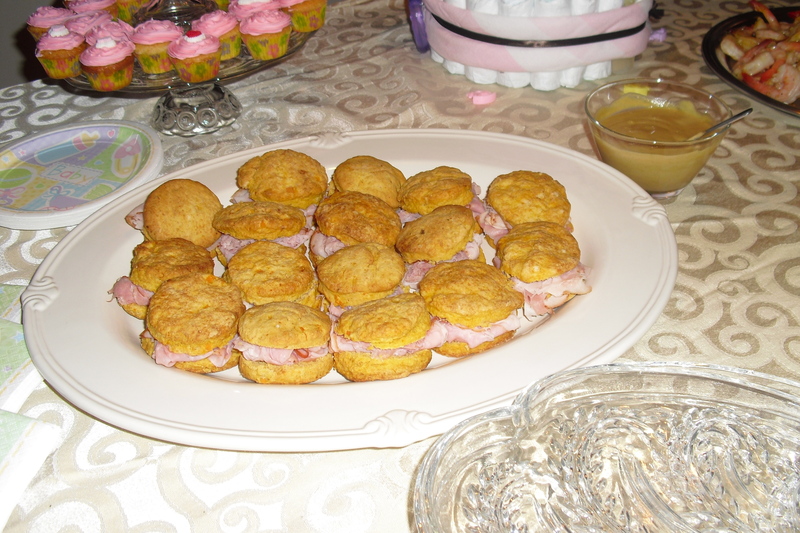 Two of them – sweet potato biscuit sandwiches with ham and honey mustard, and pickled shrimp — came courtesy of last month’s Bon Appetit. Thanks, BA editors! My first batch of biscuits turned out a little too flat and a little too brown. Fortunately, I had enough ingredients to bang out a second batch lickety split. This time, I didn’t roll them out quite as thin and I didn’t bake them quite as long. 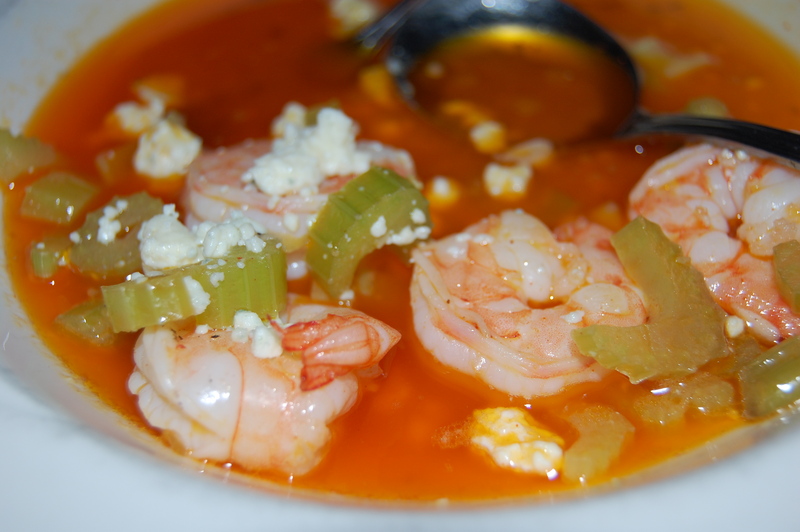 The result – yummy, although next time, I’ll use a saltier ham and a spicier Dijon to really up the flavor punch. 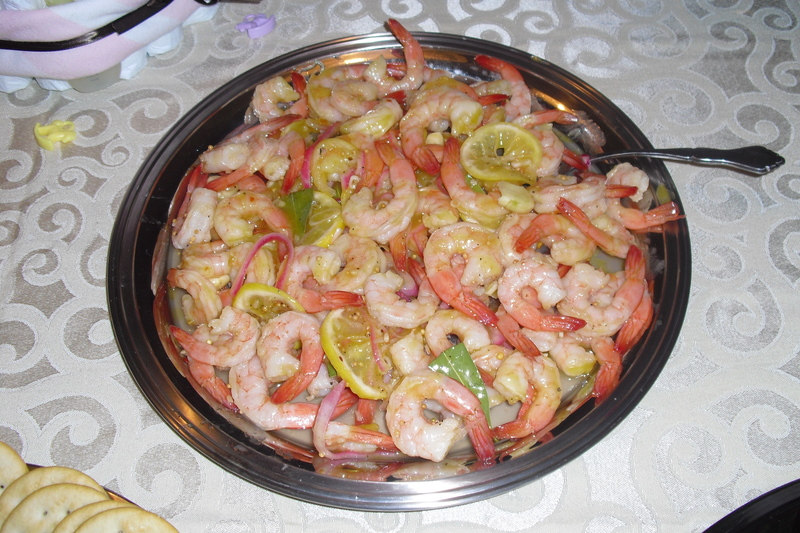 The shrimp, too, turned out to be an interesting experiment. I had quite a prep list going, so to simplify things, I bought frozen cooked cocktail shrimp instead of boiling my own. The thing was, they didn’t thaw as quickly as I’d hoped in the fridge, so when the time came to throw them into the pickling liquid, they were still slightly frozen. The pickling liquid itself was tricky. The recipe called for equal parts vinegar and olive oil, but when I tasted it, it was ALL oil. You couldn’t make out any of the other flavors – lemon, garlic, bay leaves, etc. I siphoned off a bunch of the oil and added more vinegar, salt and sugar. As the shrimp finished thawing in the pickling juice and released water, I worried that the flavors would end up being even more diluted. 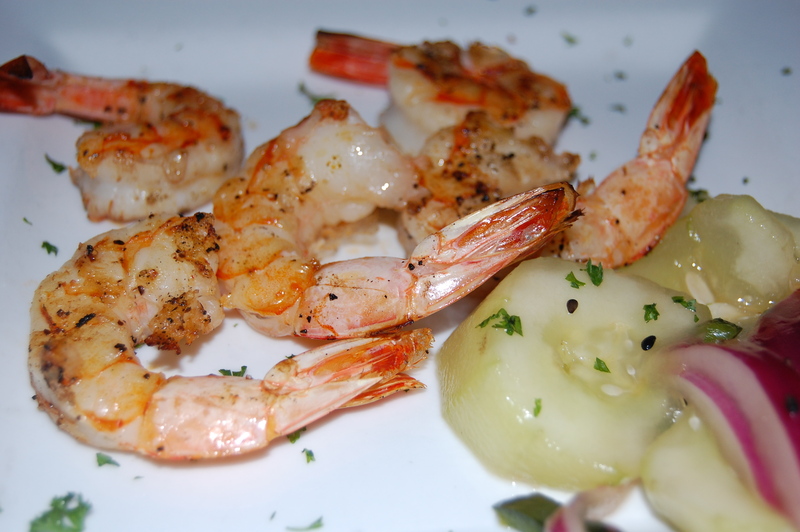 In a happy stroke of luck, by the time I drained off the pickling liquid and plated up the shrimp, I found they’d taken on a ton of flavor after all! In fact, they were quite addictive, if I say so myself. The crowd seemed to agree – there wasn’t much left at the end of the night! 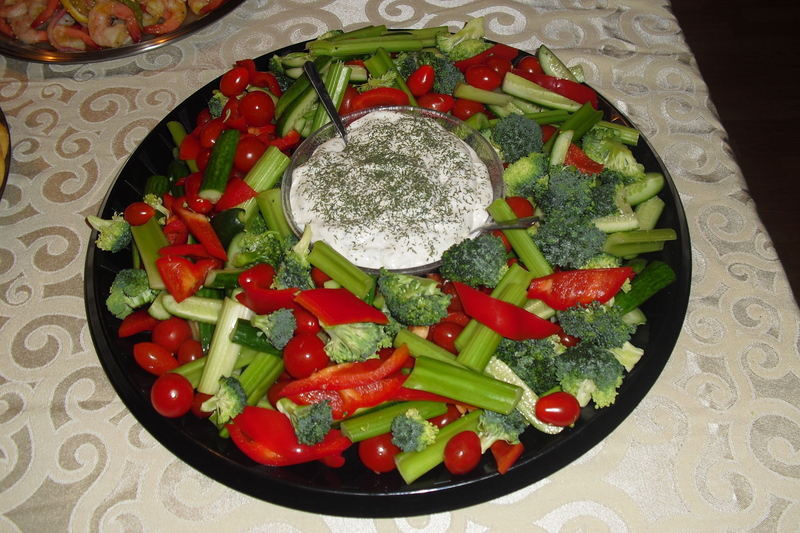 Instead of the boring old sectioned veggies-and-dip platter, I decided it would be pretty and Christmasy to do all red and green vegetables and mix them together. 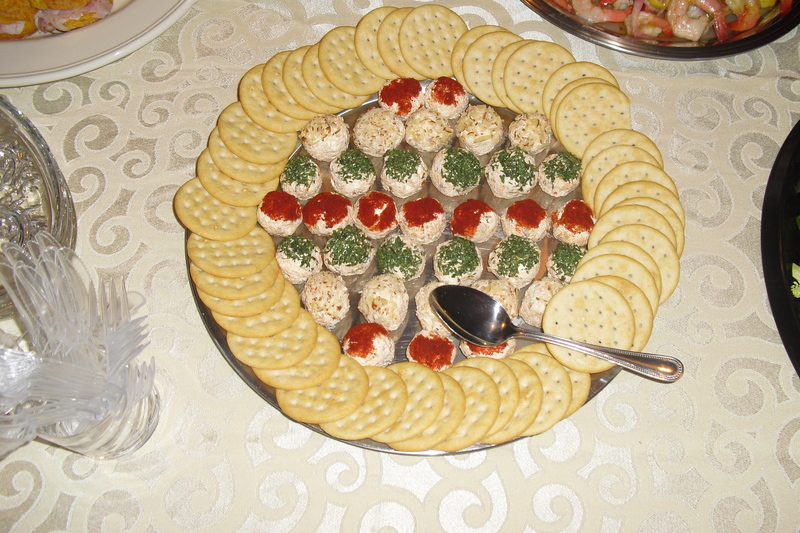 I thought it looked lovely, and would definitely use this idea again with color-coordinated noshes. For dessert, I made mini-cupcakes and frosted them to look like little roses. 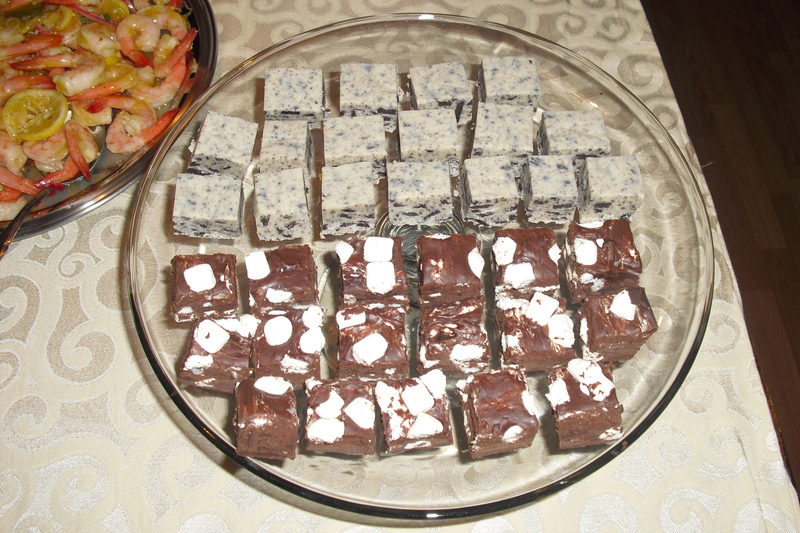 Also, in honor of the twins, I made two kinds of fudge – chocolate marshmallow and cookies ‘n creme. To wash it all down, I bought wine and beer, but also wanted to have something fancy and non-alcoholic for the mom-to-be. 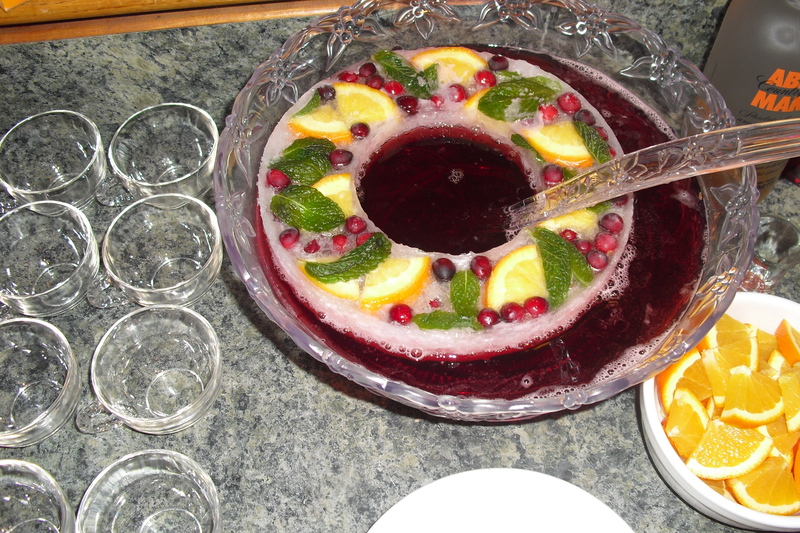 I made a quick punch of cranberry juice and ginger ale, coated the rims of the glasses with crystallized ginger sugar, and made a gorgeous ice mold to float in the punch bowl. All in all, a good time was had by all, and I think Michelle appreciated the chance to enjoy some quality time with the gals, which was the main goal. I’ve been thinking a lot about my catering biz lately, and in 2010, I would like to focus on baby and bridal showers. I feel they’re what I do best, and what I enjoy most. I like the food, I like the theme. So if you know of anyone who’s tying the knot or getting pregnant in 2010, please pass along my name and direct them to my blog for pics and details! The last few days in Italy were action-packed! Let’s see, where did we last leave off? On Sunday morning, the toddler and I took another spin around the supermarket of the gods to stock up for our last few days of supplies. After, we lunched at a place in the shopping center called “Risto.” I’ve walked by Risto a few times and was intrigued. As it turns out, Risto is like a very upscale cafeteria, Italian-style. Yummy! It has the first salad bar I’ve seen maybe ever in Europe, along with a whole handful of hot-food stations. Panini, pasta, soups, cheeses; you name it, they had it. And it was BUSY. I loaded up a big bowl of salad, and not just any salad. This bar offered some definitely Italian ingredients you don’t find just anywhere – radicchio, endive, sliced fennel, cannellini beans… good stuff! The toddler and I grabbed a table and a rare high chair to enjoy. It was a great little find. And as we were eating, an old Italian man passed our table and, best I could understand, told me that my son is a very lucky little boy. NICE! I think I’m liking Italy more all the time. Dinner at Il Pavone again Sunday night… hubby wrapped up at his show at a decent hour and we had a celebratory supper with his colleague to enjoy. Although I had pledged to try not to order the same thing twice, the fusilli della casa sang its siren call to me and I was happy to answer. A side plate of steamed spinach with a drizzle of olive oil and a sprinkling of parmesan made the perfect accompaniment. Hubby got pizza and pasta, and his colleague put us all to shame by ordering vegetable soup; an outstandingly huge bowl of seafood pasta loaded with mussels, clams and langostine; AND a pizza. Which he couldn’t finish. 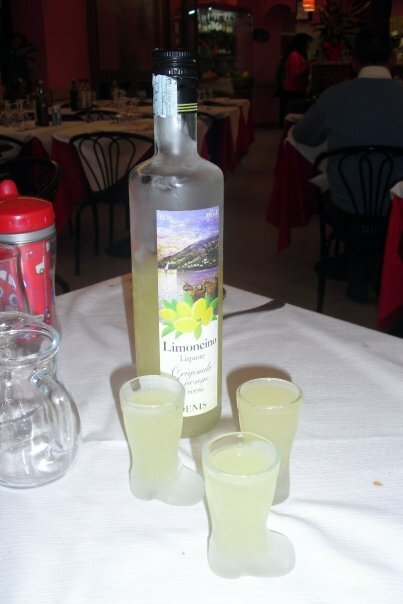 When I was in Cologne, my Hoosier laundry comrade Jerry had suggested I try some limoncello in Italy. Remembering that I hadn’t yet done so, I asked Maria if she had some. Happily, the answer was yes. Out of the freezer came a tall bottle of the lemon liqueur and three chilled shot glasses shaped like little boots. Not sure what the significance of the boot was, but it sure made for an adorable presentation. She filled them up, we toasted to Jerry and sipped. The shot tasted like a lemon drop martini, a very sweet and puckery frosty lemonade with a serious kick. YUMMY. I can’t believe I waited until this late in the week to discover this little gem. Monday was our one and only road trip, and although I was disappointed in the lack of beautiful Italian countryside I was hoping for, the stops more than made up for it. We grabbed a quick breakfast at the hotel and then set out on our big adventure. Hubby did all the driving, thank God, because I never could have navigated the Milan traffic and gotten us out in one piece. We stopped in Parma, home of Parma ham and a beautiful little town in its own right, and ditched the car to take a quick look around. We strolled past a picturesque cathedral and piazza, then onto what seemed to be the main shopping street. It was getting toward lunchtime, so we found a cute little cafe and ducked inside. A counter full of delicious-looking sandwiches served us well. I ate a fabulous wedge of rosemary-and-tomato-studded focaccia topped with a few thin slices of proscuitto crudo. Simple and wonderful. The cafe housed a series of spinning hot chocolate machines just inside the front door that looked like something out of Willy Wonka. Clearly, I couldn’t say no. After my sandwich, I ordered a cup. 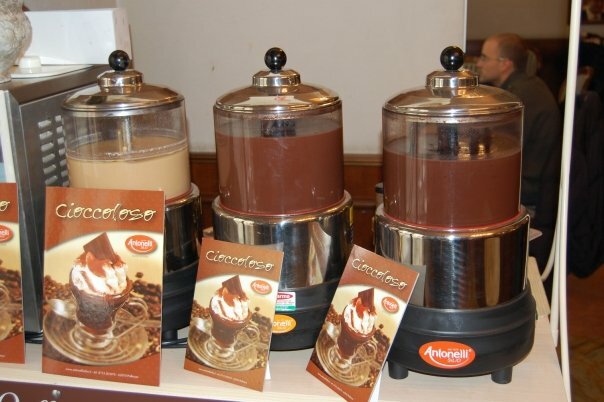 It was insanely rich, like drinking warm melted chocolate pudding. Oh my goodness. I couldn’t even finish it. Seriously, you could serve this stuff as fondue. After lunch, we hit the rest of the drive through some side roads and vineyards (I believe this is Chianti territory), past the Ferrari factory in Maranello, and then on to Ducati near Bologna. For the non-sports oriented, Ducati makes the crème de la crème of two-wheelers. Hubby calls it the Ferrari of motorcycles. As the whole reason for our being here was a motorcycle exposition, it seemed the perfect way to cap off our trip to Italy. We signed in at the gate and were met by our lovely tour guide, Violetta. She proceeded to give us a very informative and interesting walk through the top-secret factory (every single piece of these bikes is assembled by hand – no wonder the price tag!). The adjacent museum reminded me a little of the one at the Indianapolis Motor Speedway, housing motorcycles through the years along with info on when and where they raced, along with a whole wall of trophies. I’m not really a motorcycle fan, but I still found the whole thing pretty cool. The toddler, on the other hand, though he’d died and gone to heaven! He ran riot through the whole place from one exhibit to another, purring motorcycles noises the entire time. Hubby and his colleague were as happy as two little boys on Christmas morning. The journey back to Milan was fast, and uneventful, thank God, in spite of hubby’s pedal-to-the-metal driving style and a close call on the autostrade. I tried not to pay too much attention from the backseat. I think he said he averaged something like 98 mph the whole way. Not bad for a rental car. Our last Milano supper took place, where else, at Il Pavone. Hubby ordered his favorite pizza salami, and I had a fresh mixed salad and a sizzling platter of sliced steak topped with mushrooms. Mm, mm good. PDAs are de rigeur here in Italy. This is the land of amore, I suppose, but these people don’t just do a quick peck on the cheek, they nearly devour each other. I’ve seen quite a few couples out and about this week (of all ages mind you, not just the teenage variety) engaged in serious clinches. At the tram stop downtown, one such duo had their tongues so far down each other’s throats, I wanted to slip them a handful of euros and tell them to get a room. With that said, I was ready to give Milan a big, sloppy, wet kiss and say ciao, baby. After a nine-hour flight to New York, a three-hour layover, a 90-minute flight to Indy and a 45-minute taxi ride, we finally arrived home. Not that I haven’t solidly enjoyed our trip and the food that it entailed, but I’m in the mood to cook up some of the most un-Italian dishes I can think of for the next few days. Chicken stir-fry, here I come!